Living in a house with a younger sister who works at a floral shop means that there are always tons of gorgeous vibrant flowers all over my house. Since my sister started working at the floral shop I have always told myself, “Those are pretty! I should take photographs of them.” Well this time I finally did! She brought home a beautiful bouquet with purple, red, and yellow flowers. I took this picture with my Nikon D3100 with a standard 18mm- 55mm lens attached. I hand held my camera with my Neewer TT560 Speedlight external flash attached. I had the vase full of flowers positioned on my kitchen table with a light source coming from above as well as a window to provide side lighting. While I was looking at the flowers I thought about doing some traditional shots of the full bouquet with the vase and everything in view. I took a few shots of the full bouquet then my attention was taken by one red gerbera daisy surrounded by bright purple flowers. I could not believe the beauty of this single flower and I wanted to capture a photograph that showed the beauty as well as allowed the viewer to feel the same feelings. For this particular picture I had my camera’s aperture set at f 5.6 so that the background was out of focus but the flower itself was in sharp focus. My lens was zoomed to 48 mm and my ISO was set at 100 because I did not want any noise in my picture. I used trial and error to find the correct shutter speed but the setting I felt was best was 1/250 sec. I took multiple shots with the subject in different locations of the grid but felt the off centered close crop to the right side was the most flattering. 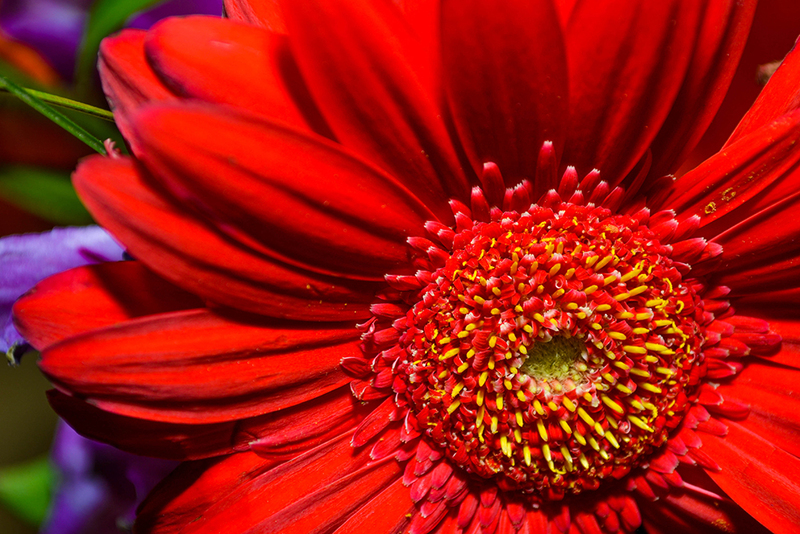 I tried multiple different angles of the flower as well but directly above the gerbera daisy straight on was the only way I could get the picture to convey the feelings that I wanted the viewer to experience. After the picture was captured I did some minor adjustments in Lightroom 4 from Photoshop. I boosted the saturation slightly as well as the exposure and contrast so that the colors of the flowers really pop and give off a warm vibe. In the end, I was very pleased with the final image that was captured. My name is Tiffany Bociung-Bodtke, I was born and raised in Flagstaff, Arizona. Growing up in such a beautiful location I have always loved taking photographs. Whether landscape pictures, macro shots, or portraiture, I love it all. If I have my Nikon D3100 hanging around my neck, I am happy. My senior year of high school I took a basic photography class. During that year I realized photography would always be a part of my life. I try to make my photographs unique by capturing things from a different point of view in a way that expresses what I am feeling.